In the 41st millennium there is only war. In the Grimdark future blood is shed throughout the galaxy with no sign of stopping. Here the Imperium of man's bravest soldiers the Imperial guard fight and die to protect those who they will never know. This RP will be a little different to anything you will have previously seen as I shall be using a point based system to dictate what you can get. You will pick from a select list, however if you want something not on the list simply ask me and I will go over it to see if it works. First up you will pick a regiment (If you want info on a particular regiment such as how they dress please ask me in the lore OOC chat) also naturally a regiments exclusive gear is not effected by any discounts they get and if you have multiple choices for exclusive gear you may only take one piece of exclusive gear. You can only take one weapon from each section (unless your regiment says otherwise). You can only take one piece of armour but you can take as much wargear as you can afford. You have 100 points spend them wisely, happy shopping! Biography: Pyotor was brought up in the harsh clime of his homeworld on nothing but potato bear kvass and the strange meat given to him in Guard rations. He learned early on to snort metal so that his battle prowess may be increased by the Omnissiah and went on to serve the emperah faithfully for the next week. Having survived that week, he was promoted to sergant. Appearance: Very full beard which he braids lighted matches into. He is covered in grime which gives what skin of his that is visible a very dingy color. He proudly wears a large fur hat instead of the standard issue helmet. No armor needed when you have Vostroyan squat. 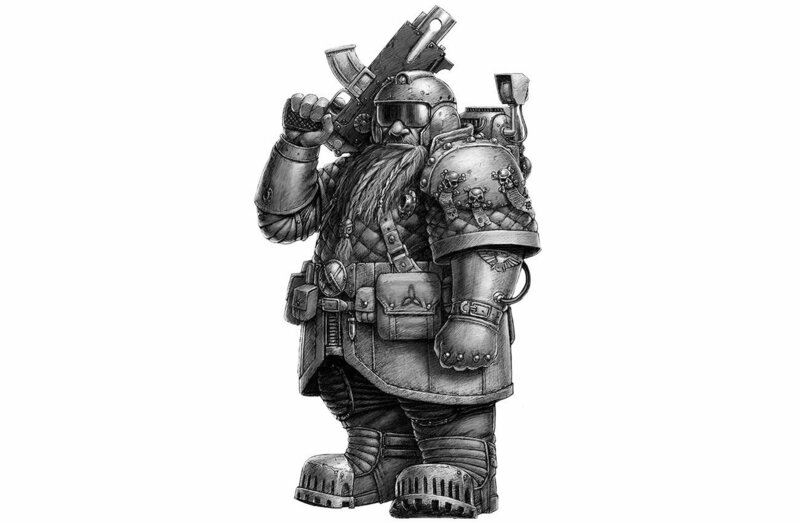 Biography: Guardsmen 2113, or 13 as they were known amongst their Cohorts was a Humble soldier devoted to Big E. They were assigned to a company providing cavalry support in the infamous "Stercus Ludicrum" system. In a routine charge (naturally accompanied by artillery fire) the entire company was obliterated, with the exception of 13; as a member of the Death Korps 13 was devastated by their survival. Unfortunately, this miraculous avoidance of death was to be the first of many; after serving in 17 companies (all of whom ended up dying in various colourful and violent ways) earned the Moniker "Lucky 13." 13 Is fiercely dedicated to the Glory of the emperor and will selflessly (attempt to) sacrifice themselves in his glorious name. Given the shockingly low life expectancy of those around them 13 has learnt not to develop any needless emotional attachments, this has also led to 13 developing a carefree attitude towards danger. Additionally, as a member of the Death Korps of Krieg 13 has mastered the legendary technique of the "Bayonet Charge" a deceptively simple manuver which has a considerable amount of subtlety and nuance. @Leoxander I have noticed a problem with your character. Because the powerfist is a melee primary weapon you cannot take it alongside a plasma gun so I am afraid but you will have to change it. Is this you I found on the vampire coast trailer? So does that mean I need to choose a secondary ranged weapon? Y'know what because of how severely you're handicapping yourself what with the whole taking the most volatile gun a bunch of grenades I'll allow you to keep your powerfist but you can't take one of the free pistols sound fair?